A Place for Every Parrot and Every Parrot it’s Place. I take great pride in my home. I also take great pride in my parrots. I have had friends visit that own parrots and they just can’t seem to figure out how I keep everything together with owning two greys and a lovebird. Well, let’s be honest shall we? I work my tuchus off to keep it that way. Greys are powdery birds so we have air purifiers in every room, not to mention I have my cleaning gadgets (3-1 Steam Mop, Hoover Floormate and Dyson Animal) that help in the process. I don’t know what we all did with just a mop bucket and a mop back in the day. Don’t get me wrong, if that is your preferred method, I salute you. I just personally love the idea of making a couple of trips around the room with my Floor Mate than having to do seven buckets to get my bird’s area clean. If it works for you, then that’s all that matters. With the spectrum of animals that we have in our house we have to vacuum and use our other cleaning toys every other day, if not every day. I am very fortunate that I live with a man who has the same standards of cleaning that I do (thank you Rita, my mother-in-law). However, you can be the cleanest and most organized of housekeepers but the truth is everything has its place and everyplace has it’s thing. That includes your birds. I am not the type of person to let my birds run around my house like a cat/dog. There are too many dangers that are out there and let’s be honest, parrots can be a demolition crew in a pint-sized package. One of my Facebook friends saw some of my photos and sent me a private message asking me how I kept my baseboards and framework intact. I immediately responded with “I keep my birds away from them”. They are expensive to install and you have to think about the things that are also associated with wood in your house. There is almost always paint or stain, glue and other chemicals that have soaked into the wood when it was being installed. Granted parrots don’t ingest everything their beaks come into contact with, but I would rather not risk it. It’s just dangerous. You may think that your house is “parrot proof”, but you never know. 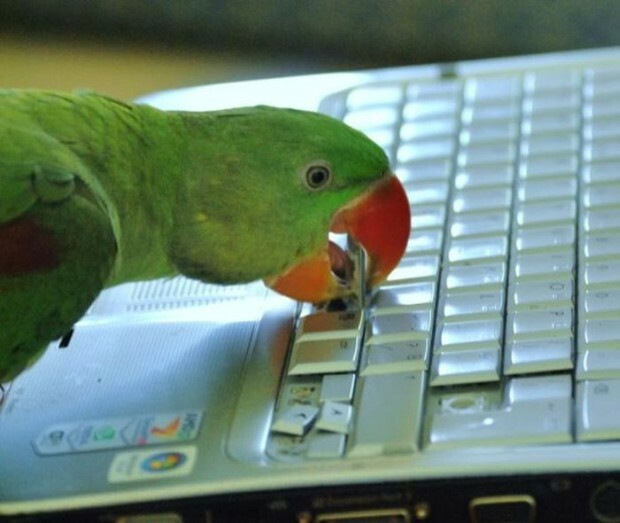 I have also seen photos on social media of parrots destroying laptop keyboards. I don’t agree with this at all. You are allowing them something to chew on that is expensive firstly, and secondly by allowing them to chew on the item you are reinforcing the behavior. So when you get up and walk into another room and your bird flies over and rips off your space bar and nine other keys, in reality you have no one to blame but yourself (P.S. if you know your bird is going to destroy your keyboard, then why would you allow it anywhere near it or any other expensive object?). It’s similar to giving a dog an old shoe to play with and then getting upset when he eats your Manolo Blahnik or Jimmuy Choo heels. You have given him an item that looks like Jimmy or Manolo, smells like Jimmy or Manolo yet he cannot differentiate the difference between that designer shoe and the old converse sneaker you gave him. Same with a parrot. Granted, things happen, I get it. But you don’t have to enable the behavior along. When I brought the greys home, they were both shown where their areas were. They have a variety of play-stands around the house. Some of you may be reading this and thinking “my bird doesn’t stay put and goes where he/she wants”. Hey I understand, parrots can be free-spirited, but do you let a two-year old run around your house with no supervision? Yeah I didn’t think so and they probably even have their own playpen. I try to make sure that my birds have a wide variety of toys that they can chew on, all with different textures and in different locations. I also have a backup supply, that I trade out and rearrange, so it’s something new. Novelty and variety is a parrot’s spice of life. In the wild they fly sometimes over sixty miles foraging for food, and things rarely get “boring”. Try to keep them entertained. They also have the attention span of a two-year old at times. You can be in the middle of training them and then…. SHINY OBJECT!! appears and it’s all over. I spend time with the birds together and separately. I also like to grab one and take them into the bedroom or while I’m vacuuming, so they get that one on one time and a change of scenery. I take them in the shower with me, even when it’s not their shower time, I look at it as a “flock” bonding time. They are however never left to their own devices nor are they left unattended, unless they are on a play-stand. If your birds are fully flighted, it may be more difficult to have them stay put. I recently bought a lovely manzanita play-stand that was exceptional quality and it was beautiful. There was just one problem. Because it didn’t have a tray area above the floor, Cooper was able to climb right down and go on “walkabout”. Before I knew it, he would have Sheldon cornered or be searching for human toes to attack. I knew I had to find an alternative stand that he could not get down from, but also had enough area for him to explore. I discovered the bottle brush stand which both birds love! It has a tray below the play area, and I am overly impressed with its quality. Every bird is different and every house hold is different. It’s important to keep your parrot from destroying something valuable, but it’s also more important to keep your parrot safe. Bottom line, that’s how I keep my parrots from destroying my house and everything in it. Like I said, every household is different, and I’m not preaching, I’m just teaching. By all means do I want to tell anyone how to live? No, but maybe just a tip or two on keeping your life sane and own parrots too. I like to learn from other people’s mistakes, if I have the opportunity. I make sure that my parrots have their place and that place has my parrots. Here, it’s paperback books. He loves them. Destroys them. Jibbles them to bits. We are at a book a day. Billions and billions of little jibbles hit the floor every day. My injured knee and ancient back were killing me cleaning this up. I found a solution. Shop Vac 🙂 Yes, a big honkin’ shop vac from Home Depot. It’s only used for the bird and his paper mess and I hide it in my room. I do the best I can, and as long as I’m comfortable and he’s happy and healthy, I’m good. That’s all that matters! I started out with a mini shop-vac, and loved it.